Schools that earned $10k-level grants were invited to speak about their projects at the luncheon, and science teacher Kyle Seiverd spoke on behalf of High School North and S.S.O.L. Feb. 8, 2019-- High School North is going to be home to another, innovative model space. This time, it will be outside. 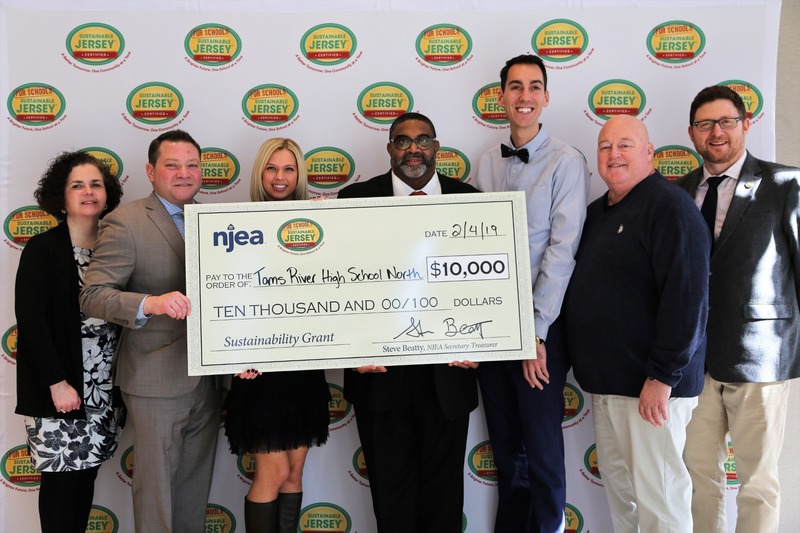 The district’s largest school was awarded one of only eleven $10,000-level grants as part of the Sustainable Jersey for Schools Small Grants Cycle, which is funded by the New Jersey Education Association (NJEA). On Monday Feb. 4, a team including TREA President Scott Campbell and HSN teachers Kyle Seiverd and Jennifer Huey-- who worked together to construct the application and who will lead the project-- attended a luncheon near Trenton to accept the award. The outdoor classroom, dubbed Setting the Stage for Outdoor Learning (S.S.O.L.) will extend from the building to an enclosed courtyard via a student-constructed “boardwalk.” A poured concrete pad will then be topped with storage/sitting benches at the corners and weather-resistant, stabilized benches. That seating will face the back of the theater department’s shed, where a stage will be built for performances and student and teacher presentations. The courtyard will be filled with native plant species, a process for which the team will consult and work with project partners including Barnegat Bay Partnership and the Jane Goodall Institute. At the luncheon, eleven $10,000 grants and thirty-six $2,000 grants were distributed to fund a variety of projects including vertical aeroponic tower gardens, student green team capacity building, outdoor classrooms, innovative recycling efforts and more. With this contribution NJEA has provided $1 million to support a sustainable future for children across the state through the Sustainable Jersey for Schools program. The intent of the outdoor space-- which is something Seiverd and Huey, who both teach science, have pursued for years and which they feel fortunate to have secured through this grant-- is to boost student learning with a non-traditional space, through the lens of environmental science. From the school’s application: S.S.O.L. will ... enhance our school and district’s adopted, well-researched, and in-practice philosophy which understands that classroom environment positively impacts student learning; lay the groundwork for a more sustainable future by introducing students to native species, our local ecosystem, and its connection to other content areas; and strengthen our bonds with community partners who are invested in the future of our students, and whose expertise will enhance and literally bring this project to life. With the full support of Principal Keller, Seiverd and Huey worked to design the project and application with district grant writer Mike Kenny and Supervisor of Educational Technology Tiffany Lucey, both members of the district’s Green Team. In 2017, High School North became one of only 15 educational institutions in the U.S. and parts of Canada and Mexico to be awarded a grant from Steelcase Education which resulted in the transformation of room C-04 to an Active Learning Center. Hosting English classes, the model space is mid-way through Year 2 of its research component exploring how the environment has impacted students. S.S.O.L. will extend that initiative, all the way outdoors. Schools that earned $10k-level grants were invited to speak about their projects at the luncheon, and Seiverd spoke on behalf of High School North and S.S.O.L. This wasn’t the first time this year Seiverd has accepted a grant award; this past fall, he and his class were awarded a nearly $1,000 grant from FirstEnergy to host a Wind Turbine Challenge. Proposals were judged by an independent Blue-Ribbon Selection Committee. 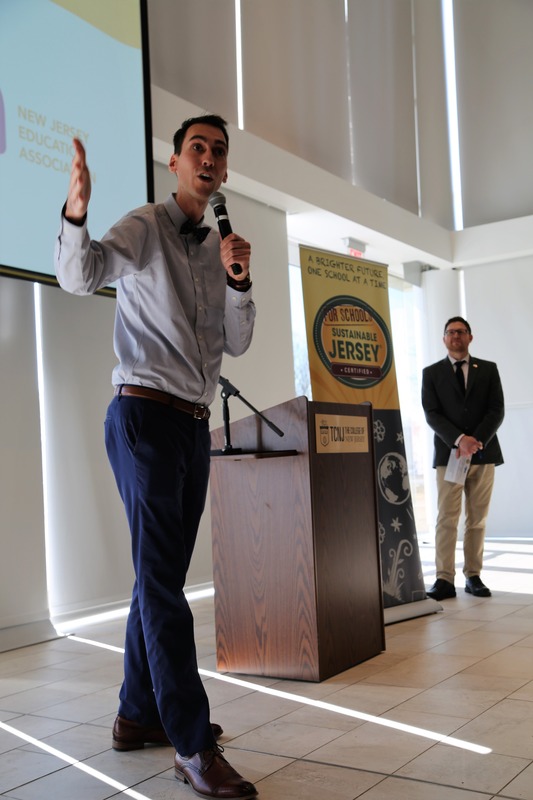 The Sustainable Jersey for Schools grants are intended to help school districts and schools make progress toward a sustainable future in general, and specifically toward Sustainable Jersey for Schools certification. For more information about Sustainable Jersey for Schools, visit http://www.sustainablejerseyschools.com/.